Meks Shortcodes is a plugin for those who want to add some nice elements inside their post/page content. You can quickly insert all of them via the user interface shortcodes generator panel. Several smart styling options are provided for each shortcode tag. It doesn’t matter if your theme is yellow, white or green, these shortcodes can fit any style and design. Below is a quick explanation and usage example for every shortcode we provide. You can use this shortcode to split your content into columns and point out some important parts of your page content. They can be used in conjunction with any other shortcodes. 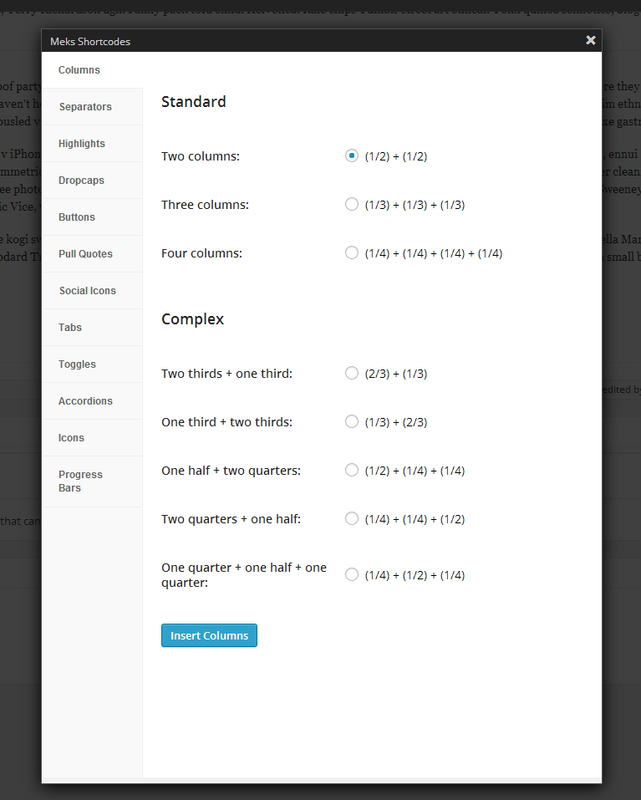 You can write any content or insert any shortcode between column tags. These are simple horizontal line elements which you may use to divide elements on your page content. Several styling options are provided. Basically, these are links with button style. You can target any URL here. Dropcaps are mostly used to make big first letter of specific sentence. You can add colored background to specific part of the sentence with this shortcode. I can't wait to see how [mks_highlight color="#dd3333"]awesome[/mks_highlight] SeaShell theme is. Stylish boxes, usually used to point out some important notes in different background. Add some icons inside page/post content with this shortcode to make the content more interesting. Add your social icons inside page/post content with this shortcode. Progress bars are usually used to graphically display some analysis. With this shortcode you can wrap some part of your content to be displayed as tabs. Use toggles shortcode if you want to display some content in show/hide manner. Accordions shortcode is similar to toggle, it is like a group of connected toggles.